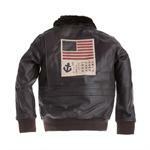 Inspired from the Hollywood legend “Top Gun”, the Kid's Top Gun Jacket has been crafted exclusively for the children. 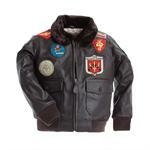 It features soft yet rugged real leather construction which will look very smart on the kids. Embellished with miniature sized patches, this imported jacket comes equipped with a poly filled map lining.